Most industrial and hazardous waste management resources cover the major industries and provide conventional in-plant pollution control strategies. Until now however, no book or series of books has provided coverage that includes the latest developments in innovative and alternative environmental technology, design criteria, managerial decision methodologies, and regional and global environmental conservation. 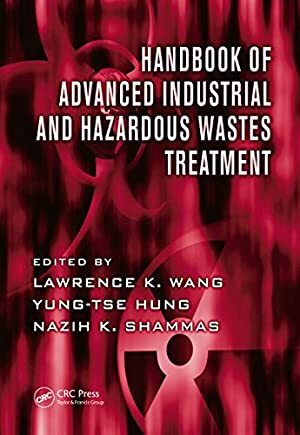 The new Handbook of Advanced Industrial and Hazardous Wastes Treatment -- together with its predecessor, the Handbook of Industrial and Hazardous Wastes Treatment -- forms a complete and up-to-date resource that contains all the necessary technical information on hazardous industrial waste treatment. Providing in-depth coverage of treatment and management technologies in wide-ranging industries that readers simply won't find anywhere else, this cutting-edge text addresses wastes in areas including metal finishing, food processing, milk production, foundries, and chemical manufacturing. It covers basic and advanced principles and applications in contemporary hazardous and industrial waste treatment and explores new methods of clean production, waste minimization, and the treatment of landfills and underground storage tanks. Coverage includes the latest developments in legislation, regulations, soil remediation, brownfield site restoration, bioremediation, enzymatic processes, and much more. Complete with numerous figures, tables, examples, and case histories, this book provides technical and economical information on how to develop a total environmental control program that can benefit both industry and local municipalities. This book combined with the Handbook of Industrial and Hazardous Wastes Treatment forms a resource that is comprehensive in scope and directly applicable to waste management problems in a broad range of industries. Track It. This book has been $239.96 within the past year. We started tracking this book on July 31, 2014. This book was $257.55 when we started tracking it. The price of this book has changed 235 times in the past 1,725 days. The current price of this book is $391.07 last checked 3 months ago. This lowest price this book has been offered at in the past year is $239.96. The lowest price to date was $239.96 last reached on March 10, 2018. This book has been $239.96 4 times since we started tracking it. The highest price to date was $480.87 last reached on May 27, 2017. This book has been $480.87 2 times since we started tracking it. We last verified the price of this book about 3 months ago. At that time, the price was $391.07. This price is subject to change. The price displayed on the Amazon.ca website at the time of purchase is the price you will pay for this book. Please confirm the price before making any purchases.